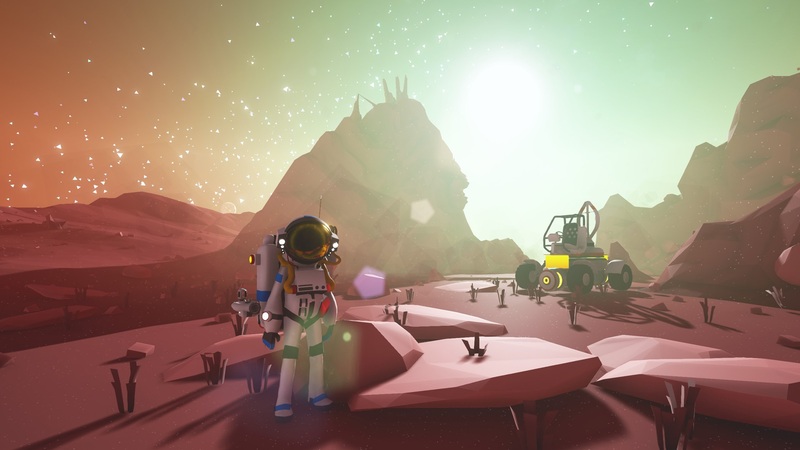 I first played Astroneer at PAX West earlier this year, and it caught my attention immediately. It's near impossible to describe without mentioning No Man's Sky (NMS), as they're both procedurally generated games that revolve around exploration and upgrading your character. 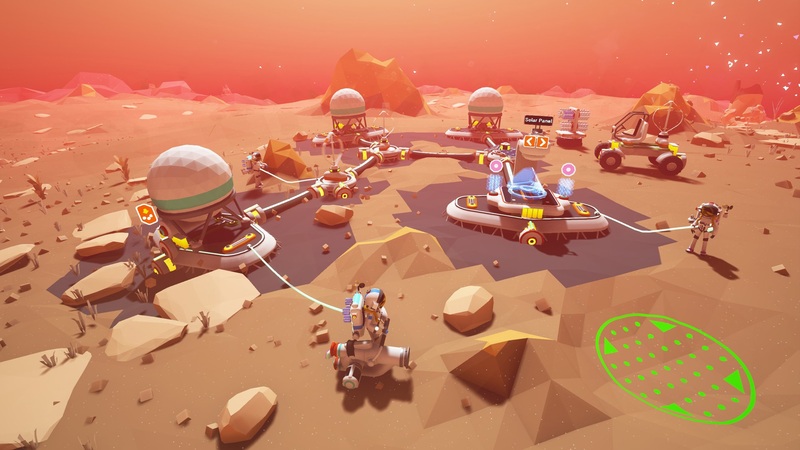 Unlike the higher-profile NMS, Astroneer focuses on base building and terrain deformation, with each procedurally generated planet composed of flat-shaded polygons that can be added to or destroyed by your mining tool. The malleability of the world is one of the strongest features of Astroneer, and it's a lot of fun just playing with the mining tool, making holes or constructing giant sculptures out of dirt. I asked the developers during my PAX demo, and they told me that given enough time, it's theoretically possible to punch a hole through the world and come out the other side. What's more, up to four players can join the same planet simultaneously and work together to upgrade their bases and explore the planets. The first thing you'll notice about Astroneer is that it's quite minimalist in its presentation. There's no on-screen heads-up display, and the game trusts you to figure everything out through experimentation and gameplay rather than forcing you to sit through a tutorial. It will nudge you in the direction of a few resources you'll need to expand your base at the outset, but for the most part, you're meant to explore and figure things out on your own. Your Astronaut/Pioneer (Ohhhhhhh.) lands on a random planet and it's up to you to decide what you'd like to do from there. Your shuttle pod will provide oxygen as long as you're within range, and your backpack has space for some add-ons that will make it easier to explore and collect resources. By default it comes equipped with a solar panel that powers your mining tool, though this won't do you any good at night or underground. Fortunately, it also has a built-in 3D printer that you can use to craft yourself some upgrades, provided you can find the proper raw materials. There are two main resources in Astroneer, Oxygen and Power. You can monitor your oxygen level by keeping an eye on the blue bar at the top of your backpack. Power is represented by the yellow stripe down the center. You'll find raw units of both out in the wild that can be collected by your mining tool, and keeping extra on hand will help extend the range of where you can explore. If you're lucky enough to find some Lithium or Titanium, you can also craft yourself a battery or spare oxygen tank that will let you store more on your backpack. One thing I really like about Astroneer is how everything about your base is modular. Every station you build has slots that you can insert resources into for safekeeping or storage, or you can use those slots to place power generators that'll help keep your base running smoothly. It feels great, like snapping together Legos. Once you start building rovers, you can even hook them to the base to recharge their batteries if necessary. The first resource you'll probably find is Compound, and this is used in almost everything you build. You'll want to start by making some tethers, as these will expand the range you can explore without needing to worry about running out of oxygen. You'll probably also run across some Resin, which is needed to expand your base. While it's tempting to build stations all the way around your shuttle, you shouldn't. Instead, make sure to build some extensions first, which you can do by clicking on the hose extending out from the pod, then spending one Resin to create an extension. Doing this ensures you won't run out of space to place build stations later on. You'll probably want to attach some solar panels to your base as well, since all of your build stations require power to function. If you run out of power or if it's dark, you can recharge a station by putting a power block into one of the slots. Tethers allow you to explore farther away, and also provide a light source. You don't have to stick them on the ground either, and you may find it more helpful to attach them to the walls or ceilings in cave systems. They do have physical presence and will get in the way if you're trying to drive through them, so you may want to leave space for your rovers when you place them. Once you've explored a bit, you'll find there are pods and chunks of material that you can pick up, but can't do anything with. These can be found high in trees, under or on top of strange rock formations, deep in caves, or near crashed space vehicles. You might have to dig them out or dig under a tree to get to them. You'll want to bring these back to your base to scan them, since they can unlock new crafting recipes or rare resources. This is where having multiple people playing in the same game can be helpful, since bringing pods back to your base can be somewhat time-consuming. 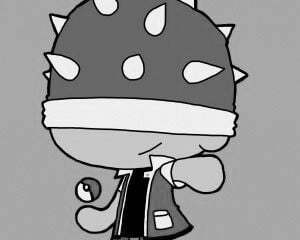 Unfortunately, only the host will be alerted to what your research station has unlocked, and they'll need to let the other players know some other way. 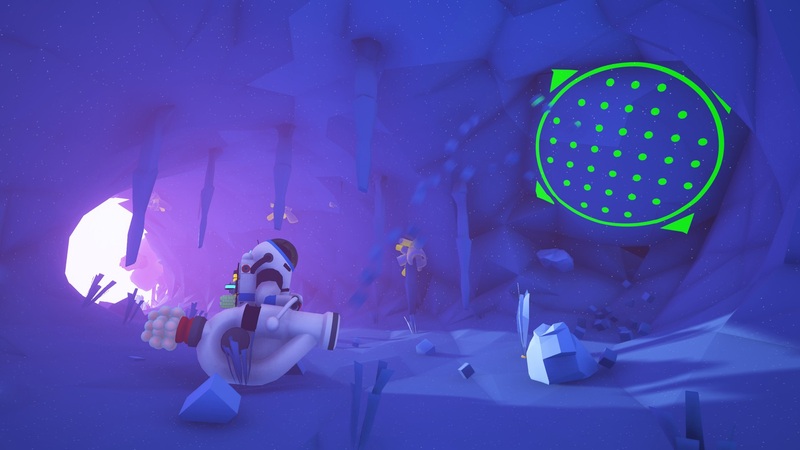 There are only a few ways to die in Astroneer, and they make sense for the most part. Running out of oxygen is always a concern, and falling from a great height will end you as well. Occasionally, strong storms will sweep the planet, and you'll need to be underground or in a vehicle to avoid being crushed by flying rocks. There aren't any enemies in the game yet, though you may run into some spore-spewing fungus underground that will kill you if you stand near it for too long. These fungi can be neutralized by digging underneath them, and you'll know when it's safe to go by because you'll hear sort of a squelching sound, and they'll stop releasing green gas. If you do die, you'll respawn at your pod sans whatever you were carrying at the time. Fortunately, you can recover anything you had been holding if you can make it back to your body. Part of the fun of Astroneer is discovering things for yourself, so I'm hesitant to go too deep into its intricacies. Here are a few tips that I wish I'd known when I started, though. You can re-enter your pod at the center of your base at any time by pressing Tab. This doesn't normally have much use, but it can protect you if a storm hits, and you can also save your game this way. You can do the same at any vehicle. You can attach multiple rovers together, provided they're close and positioned correctly. This can be a far more efficient way of transporting research material back to your base, though the rovers tend not to do so well on uneven terrain or underground. You can attach as many as you want, though the game chugs on my system with a train of more than three. Rovers provide oxygen just like your base does, and you can set up tethers from them too. Although you can mine directly beneath yourself, it's not usually a good idea. If you get stuck in a deep hole it's usually harder to get out than in, and if you build up terrain underneath yourself, there's a good chance you'll fall through the world and die deep underground. When you unlock the Fuel Condenser and Trade Platform, try to build them close together. Making Fuel just costs power, and once you have extra you can trade it for other resources. You may want to build the Fuel Condenser close to your Vehicle Bay as well. Eventually you can build a shuttle or rocket to travel off-planet, but it takes a lot of fuel to do so. Attaching batteries to your base will help you be less reliant on sunny days to put work in. As soon as you can, build a large battery from two Lithium and attach it to your base. There are alternate power sources as well, and you may want to add a few of these to your base for night work. Compound is extremely useful, and you can always keep one in your suit's 3D printer ready to make more tethers. Once you've played for a while, you can also use Compound to provide emergency power or oxygen, so it's a good idea to bring some with you on long trips. Astroneer is getting frequent updates, so if you're having trouble connecting to a friend's game, make sure you both have the same version. At one point I exited to the desktop and when I came back, the game had updated and it took me a while to figure out why I couldn't join my friend's game anymore. 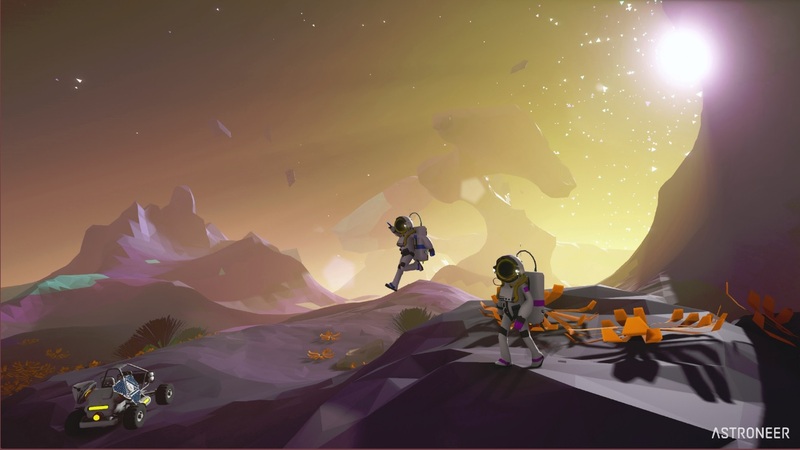 Astroneer is a little rough around the edges, but there's a lot of potential here. It's already extremely compelling, even in its early, pre-alpha state. There's no real endgame yet, so if you're goal oriented you may want to wait until this one's had a few more updates. That said, it's really cool to be able to morph the terrain, digging alternate paths to a resource or building bridges for your rover. It's even better with a friend or three, so if you're into space exploration games, I'd highly recommend checking out Astroneer. There's a free trial available, and you can get the full game on Steam Early Access or Xbox One via Game Preview.